Kevin Harvick, driver of the No. 4 Jimmy John’s Ford Fusion for Stewart-Haas Racing (SHR), has – with all due respects to the band Smash Mouth – “got his game on” this year as he looks to further upgrade his all-star status Saturday night in the Monster Energy All-Star Race at Charlotte (N.C.) Motor Speedway. Harvick has dominated this season with five Cup Series victories, three of which have come on intermediate tracks similar to Charlotte – Feb. 25 at Atlanta Motor Speedway, March 4 at Las Vegas Motor Speedway and last Saturday at Kansas Speedway in Kansas City. In addition to his impressive results this season, Harvick’s All-Star Race history is noteworthy, as well. He’s making his 18th consecutive All-Star Race appearance, which will move him ahead of Dale Earnhardt, Darrell Waltrip and Bobby Labonte and into a tie with Matt Kenseth and Dale Earnhardt Jr., for the fifth-most consecutive appearances. Mark Martin has the most consecutive All-Star appearances at 24, and Jeff Gordon is second after making his 22nd straight appearance prior to his retirement at the conclusion of 2015. Rusty Wallace and Harvick’s team owner Tony Stewart are tied for third with 19. The 2014 NASCAR Cup Series champion earned his first appearance in the All-Star Race during his 2001 rookie campaign, when he scored his first Cup Series win in only his third start at Atlanta that March, when he started fifth, led 18 laps and beat runner-up Gordon by .006 of a second for one of the closest finishes in series history. While it took Harvick just three races to qualify for his first All-Star Race, a brake issue in the non-points event in Charlotte forced him to retire after only 19 laps. He finished 21st. Harvick won the 2007 All-Star Race when he started fourth, led 20 of 80 laps and beat runner-up Jimmie Johnson to the finish line by .141 of a second. The win made Harvick an automatic All-Star qualifier for the rest of his full-time career. However, he has also qualified for the All-Star Race by virtue of a win every season since 2010, as well as via his 2014 series title. In addition to the 2007 win, Harvick has three runner-up finishes in the All-Star Race – two in the last four events and both under the SHR banner. He started third, led five laps and finished second to race-winner Jamie McMurray by .696 of a second in 2014. In 2015, he started 20th and finished second by .923 of a second to Denny Hamlin. Harvick has three career points-paying victories at Charlotte winning the Coca-Cola 600 in both 2011 and 2013, and the Bank of America 500 in 2014. While his Charlotte resume is rock solid in several respects, there will be some new modifications this weekend that the veteran driver and his fellow competitors will have to deal with in order to earn the $1 million prize Saturday night. Each car will be required to use a horsepower-reducing restrictor plate – typically reserved for superspeedway races – as well as a splitter borrowed from the 2014 rules package, a 2018 radiator pan, a 6-inch-tall spoiler with two “ear” extensions measuring 12 inches tall, and manufacturer-specific air ducts designed to minimize the advantage of lead cars in undisturbed air. There will also be a format change to the non-points feature race that is expected to add even more thrills to what it typically one of the wildest events of the year. The race is set to run in four stages – Stage 1 scheduled to end on lap 30, Stage 2 on lap 50, Stage 3 on Lap 70, and a final shootout that ends at the 80-lap race distance. Only green-flag laps will count during the final stage. NASCAR overtime rules will be in effect for the end of each stage. It’s designed to promote passing and tight competition, similar to the package the NASCAR Xfinity Series used at Indianapolis last year in a race that featured a record number of leaders and lead changes. This year’s scheduled race distance is also 10 laps longer than the 2017 edition but will feature a pared-down procedural structure. Unlike previous formats, there will be no mandated pit stops, no choice of alternate tire compounds, no eliminations and no inversions of the running order. 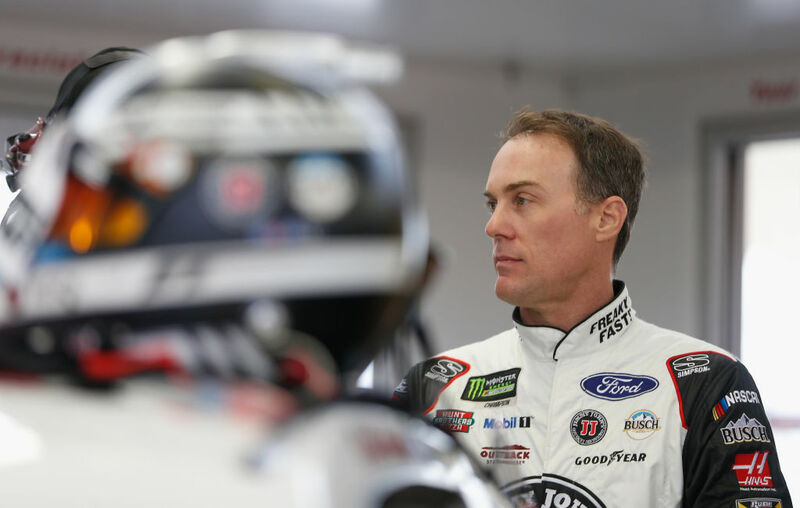 That being said, Harvick is up for the challenge and ready to “go play” as he channels the “All Star” single in his pursuit of another All-Star Race victory this weekend. What makes this group of guys so successful each week? How mentally fatiguing is it to have that all-in mentality all the time? When you look at the makeup and culture at Stewart-Haas Racing, what sticks out to you?